The Living Room of the Cody portion of the Cody-McCausland House, restored by the National Society of the Colonial Dames in Iowa is a simple, country, late Empire, early Victorian room. The carpeting is hand-woven from rags, and laid wall-to-wall, which was typical of the period. The Galena daybed is covered with a hand-woven fabric and has two round bolsters. During the Nineteenth Century, music invaded the American home to such an extent, that to play a keyboard instrument was considered a cultural essential. Americans were partial at this time to simplified organs known as melodeons. One is seen in this room. Currier and Ives prints were also popular at this time and an original is hung in this room. The cupboard was the repository for books and better china. Candlesticks and oil lamps were used for illumination. Heat for the room came from an iron stove such as the one seen. 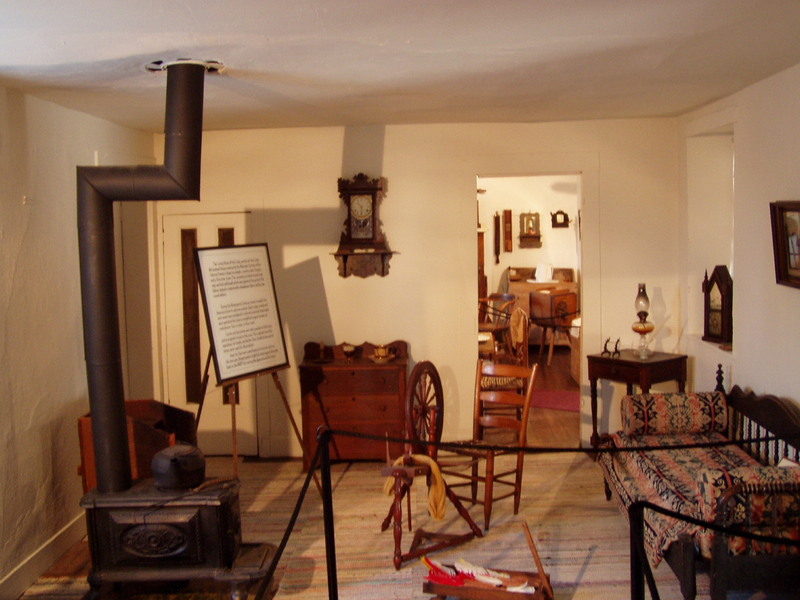 Homesteaders took full advantage of stove pipe heat in the 1840's by running the pipes around the rooms.